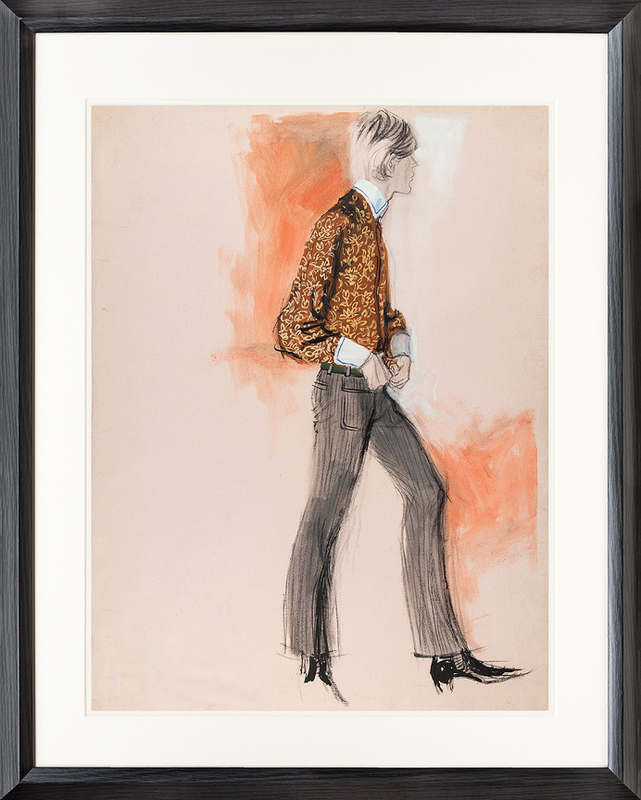 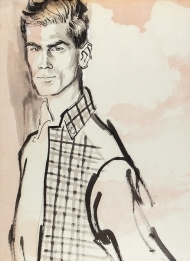 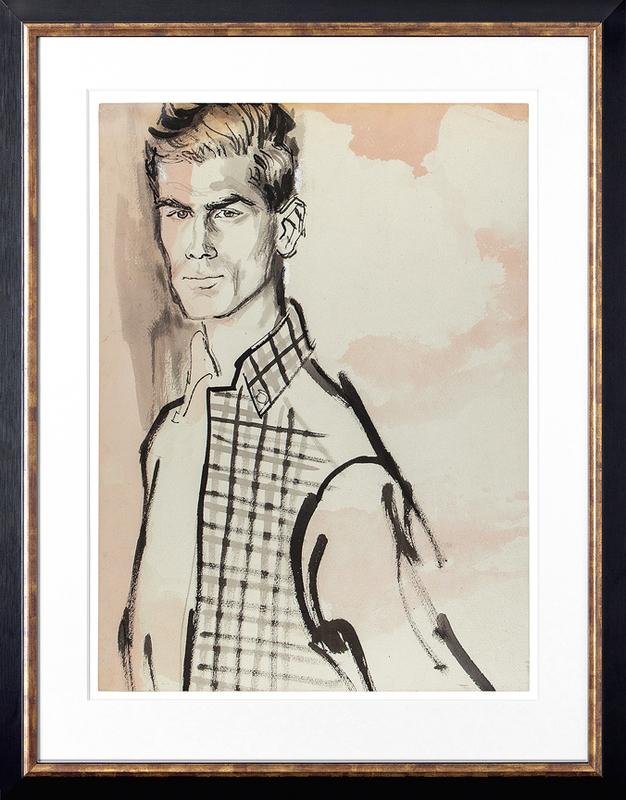 While Stonehouse is best known for his 1950s American Vogue fashion illustrations of women’s wear he was also charged by the editor, Jessica Daves, with illustrations for the innovative pages covering menswear, particularly leisure wear; ‘Men News’, ‘Shop Hound’ and ‘Men in Vogue’. 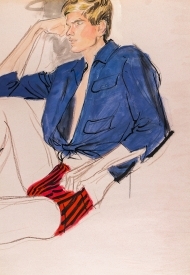 When Diana Vreeland revamped American Vogue on her appointment in 1962 he left to concentrate on his portrait painting practice, supporting himself with fashion illustrations for those Department Stores and Brands with whom he established contacts while at Vogue. 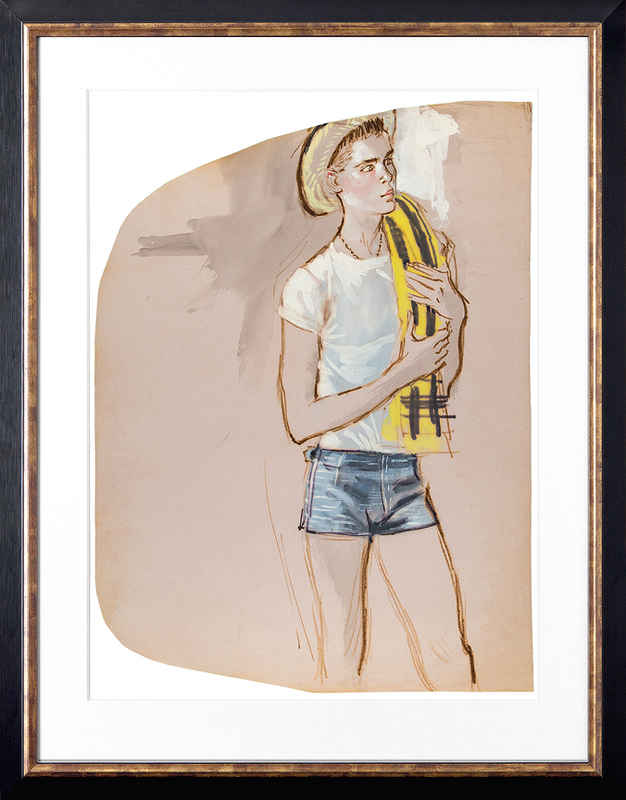 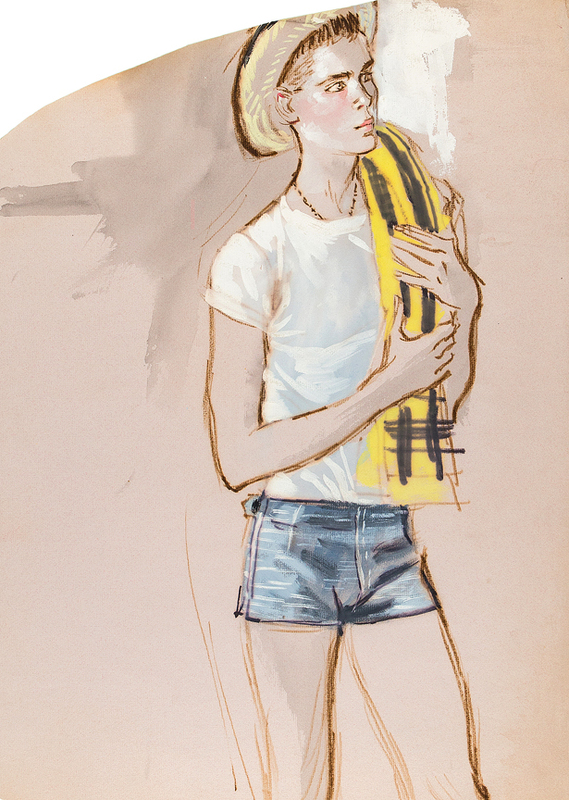 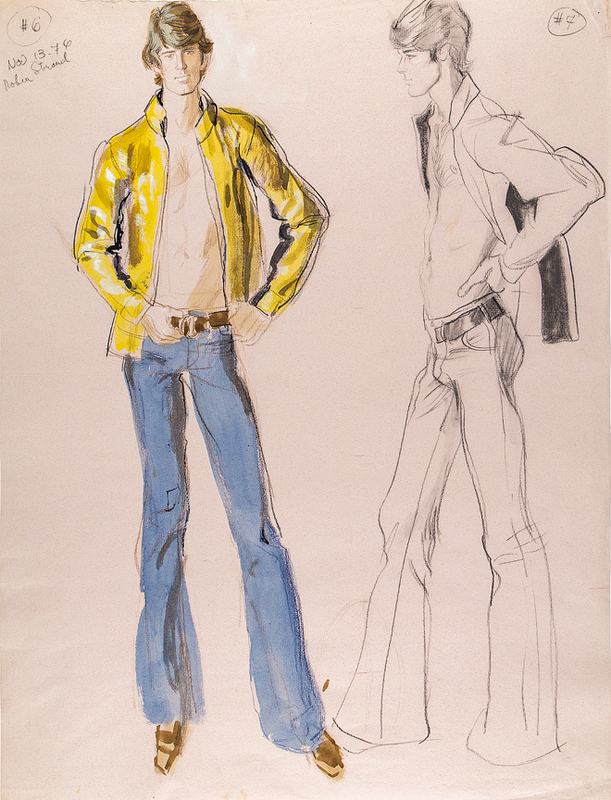 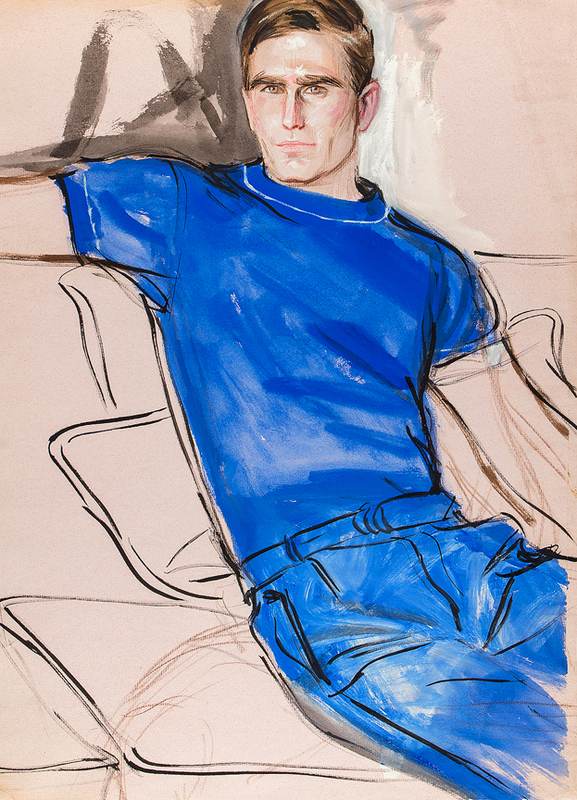 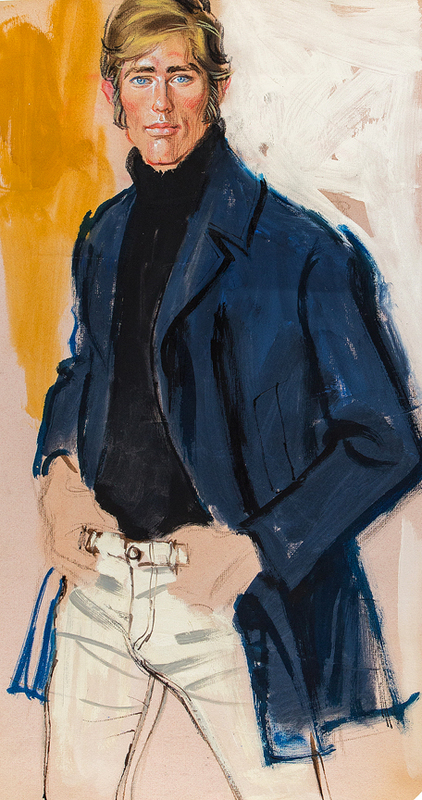 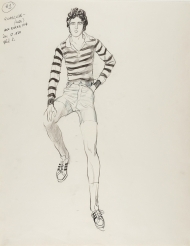 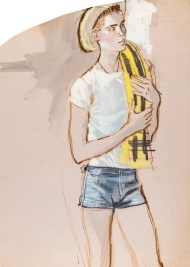 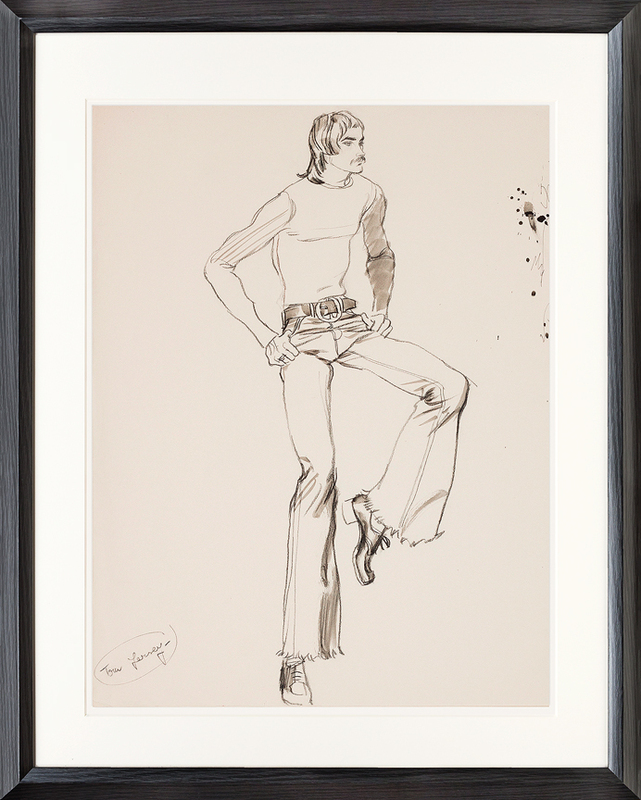 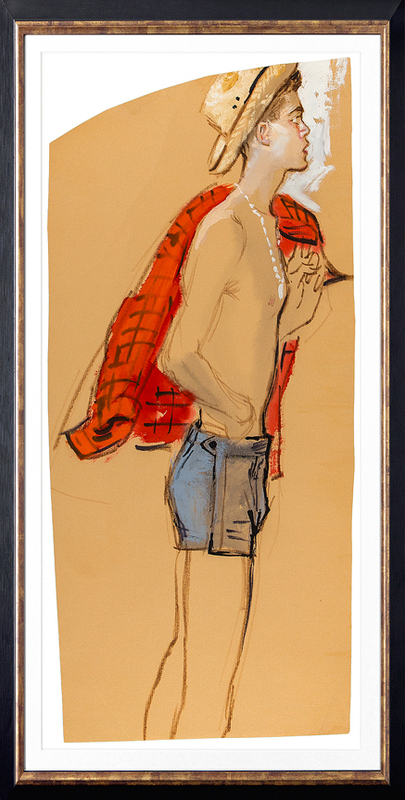 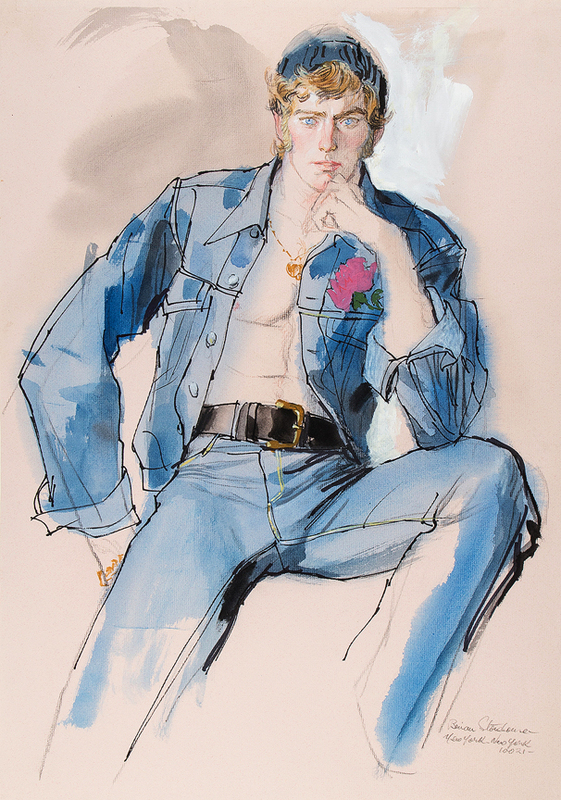 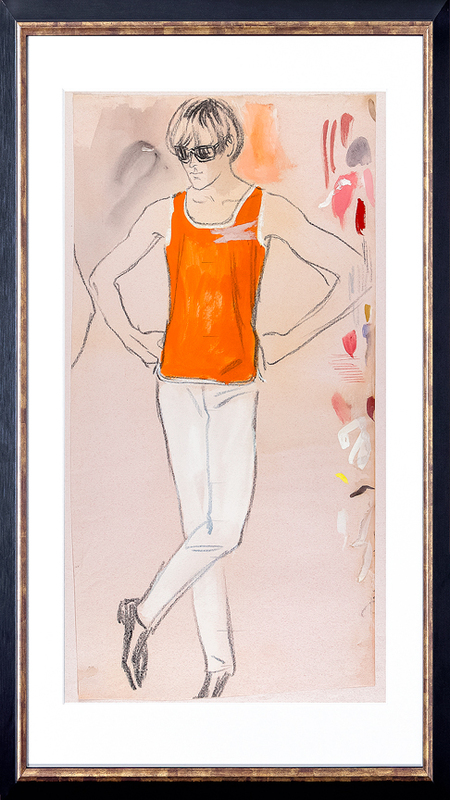 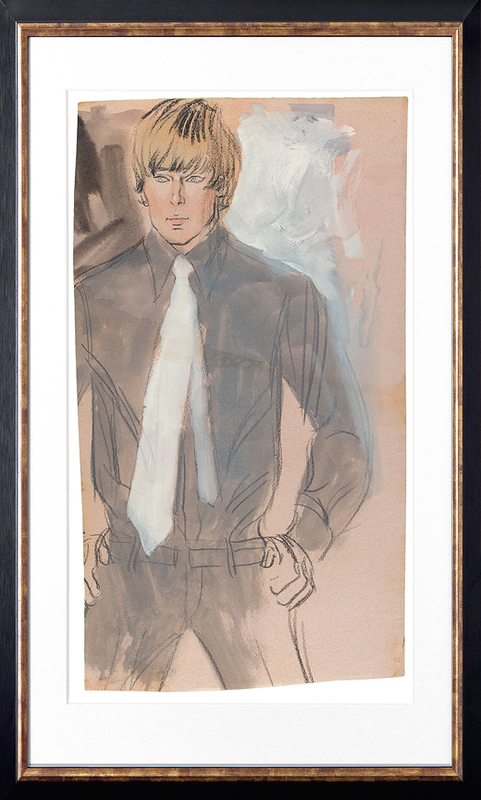 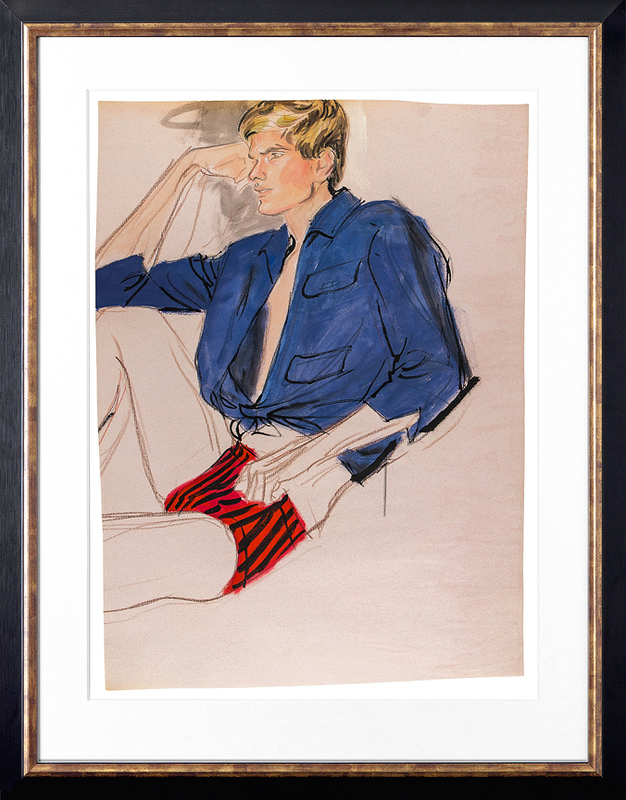 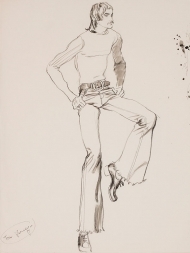 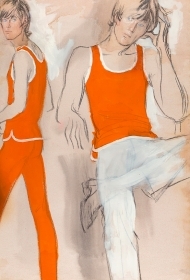 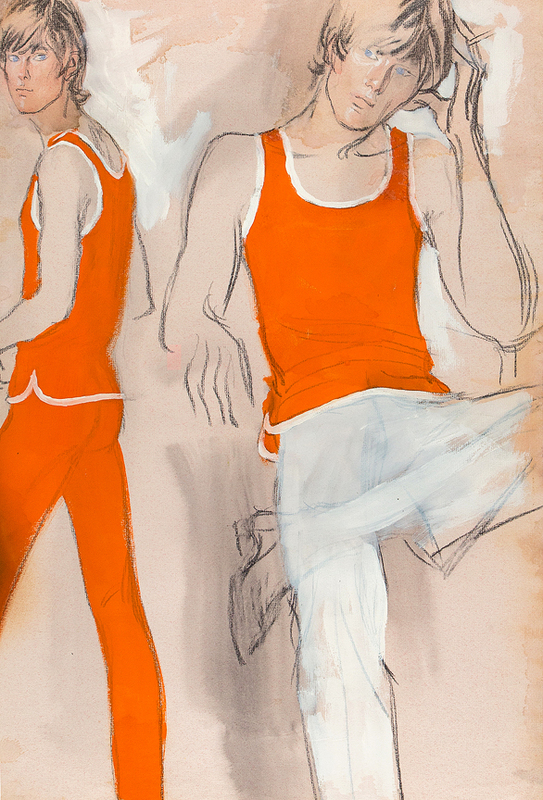 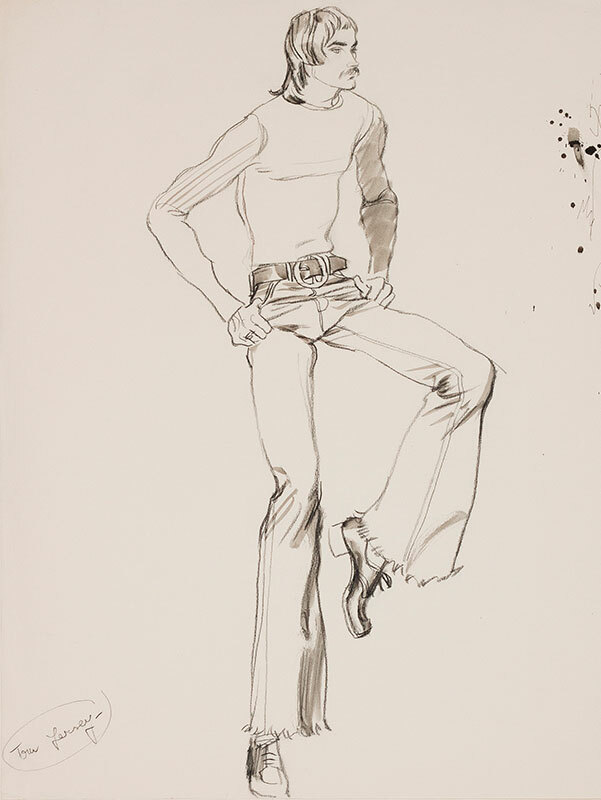 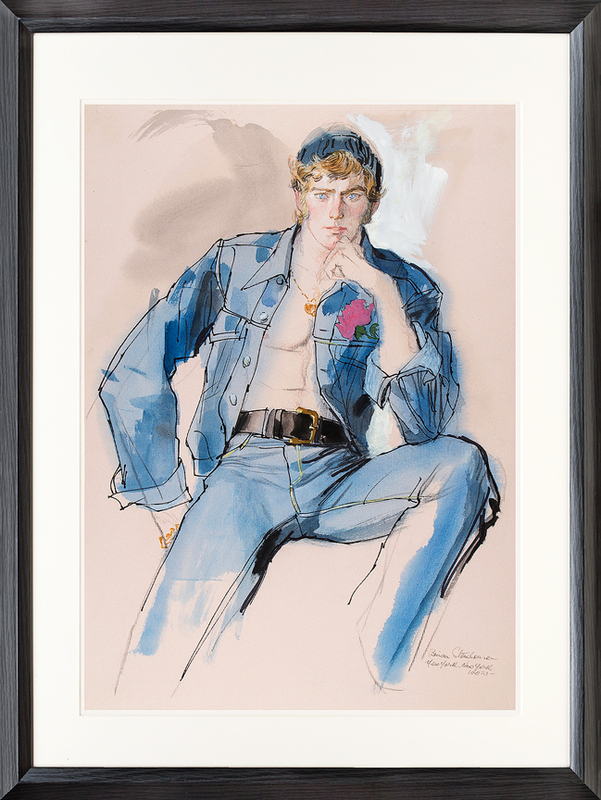 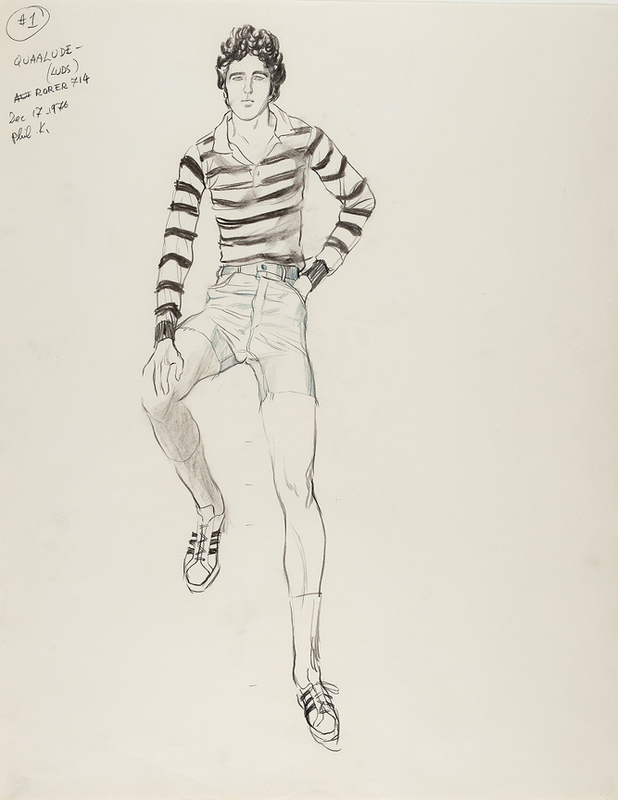 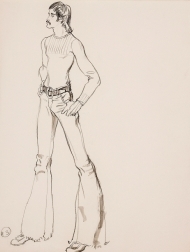 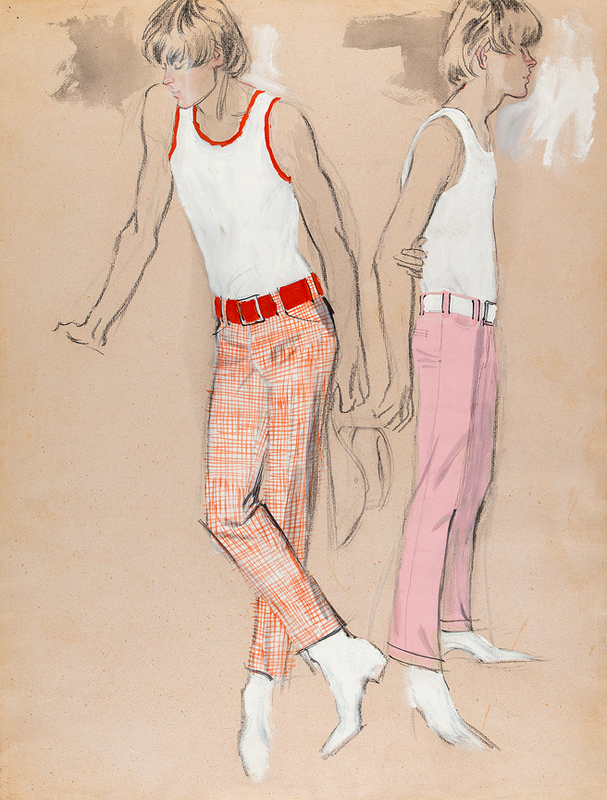 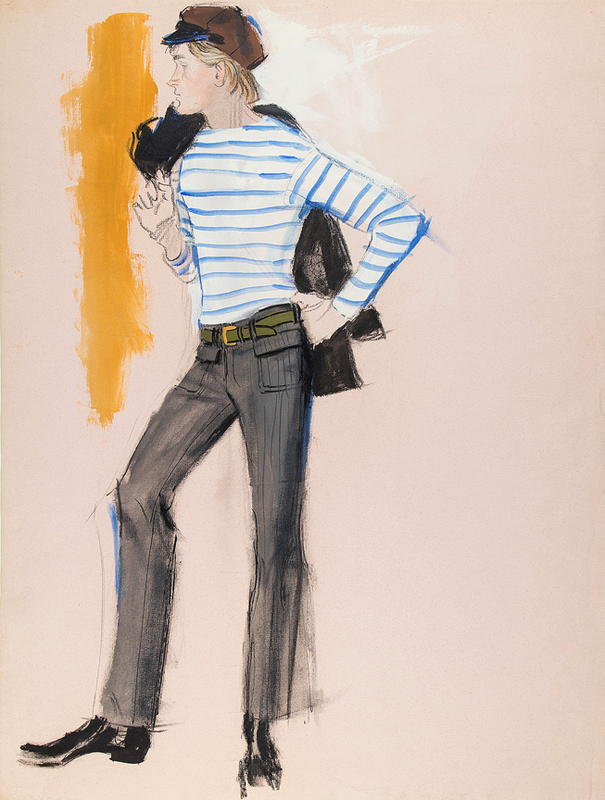 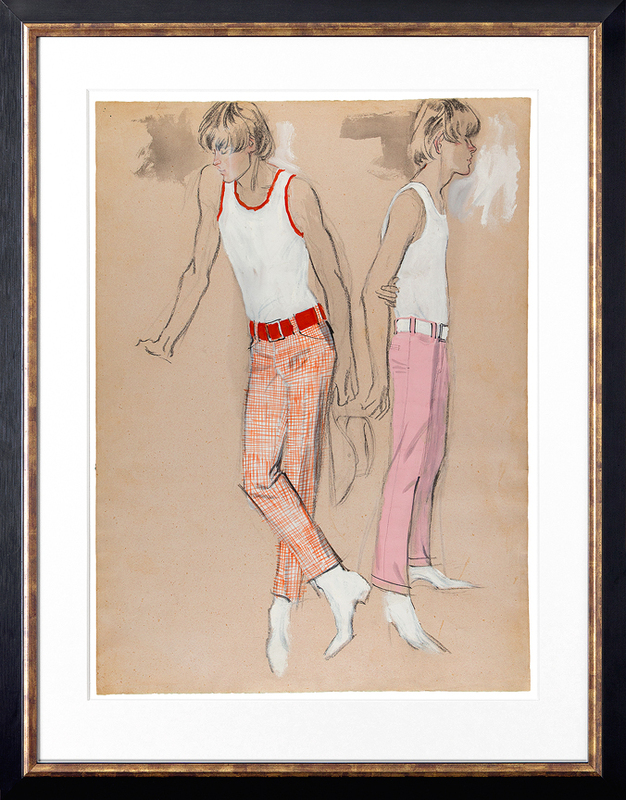 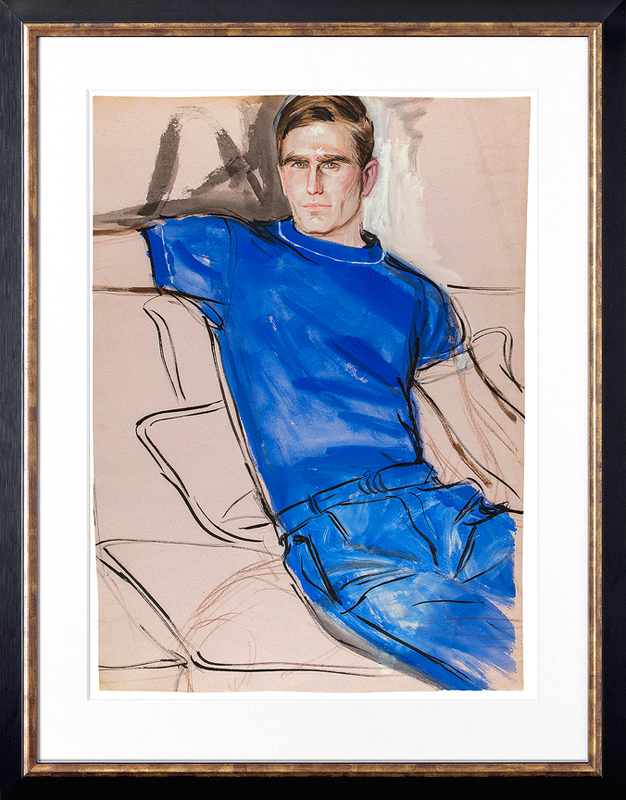 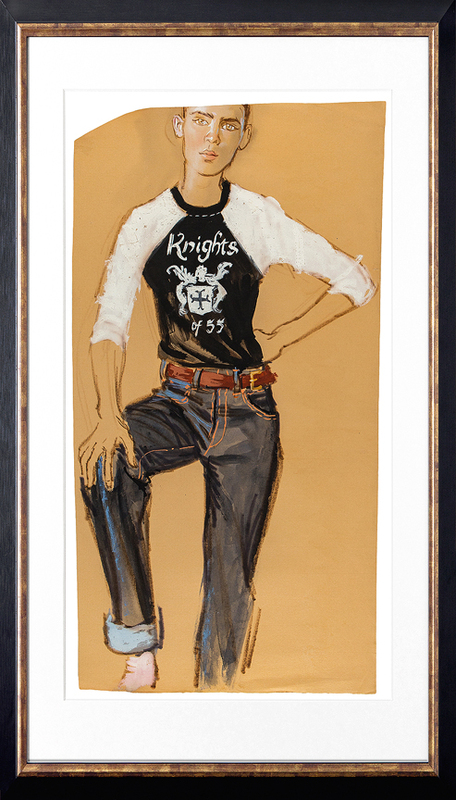 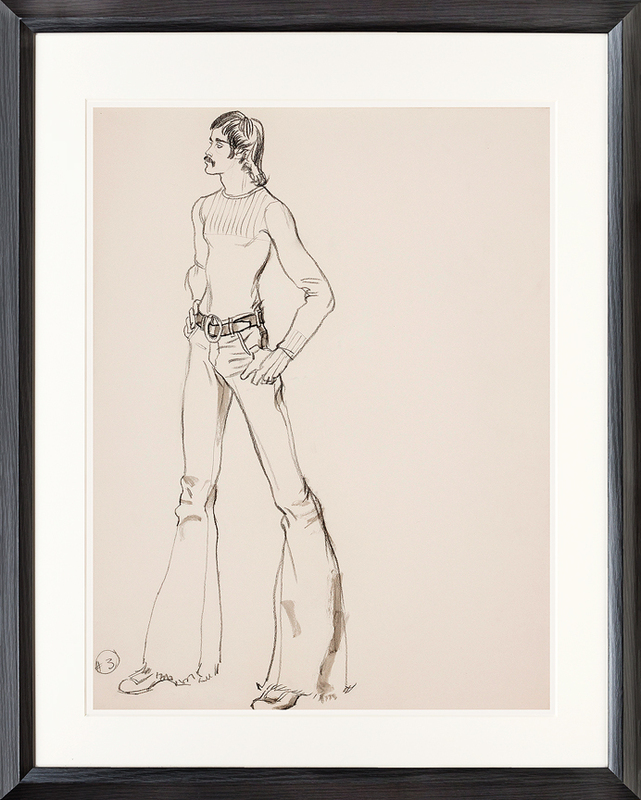 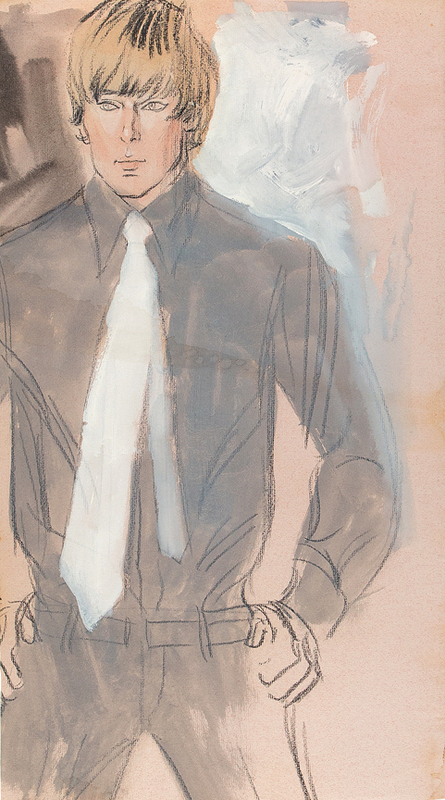 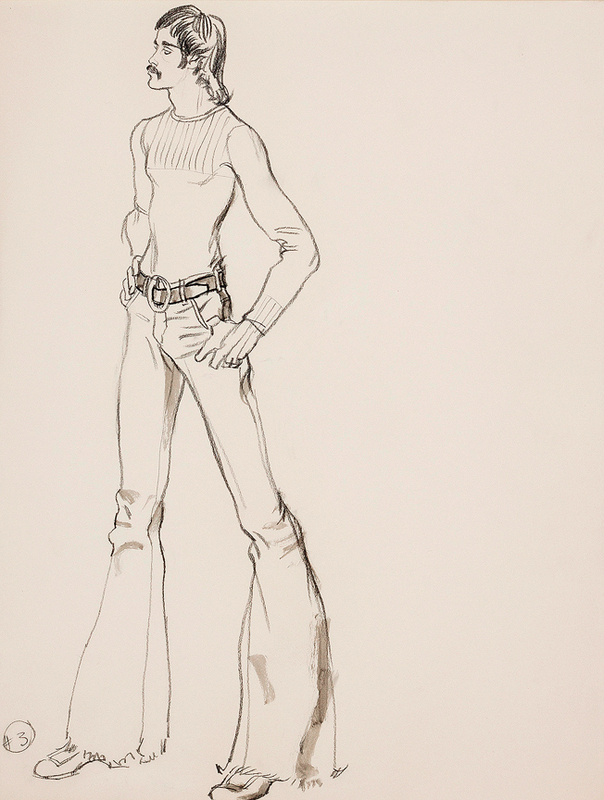 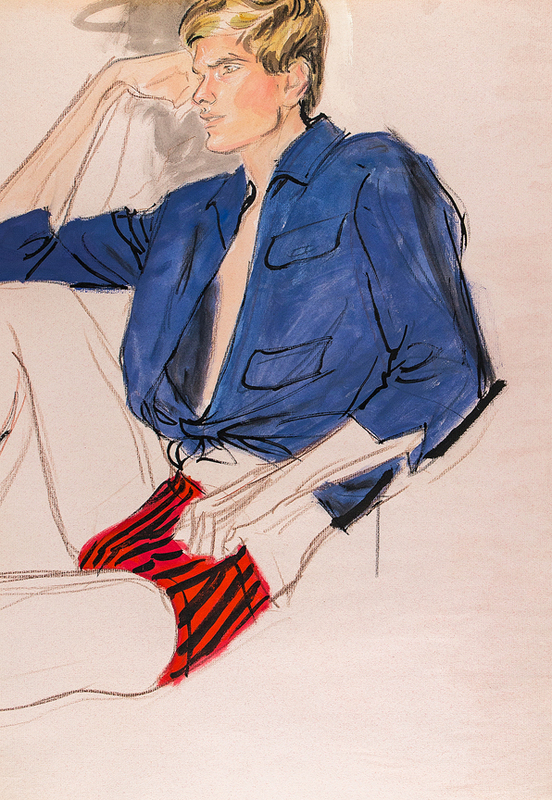 Whilst his Estate held few works from the 60s – a Studio fire destroyed many of them – this group of fashion illustrations of early and mid 70s leisure wear for men and boys survives from his final decade in New York. 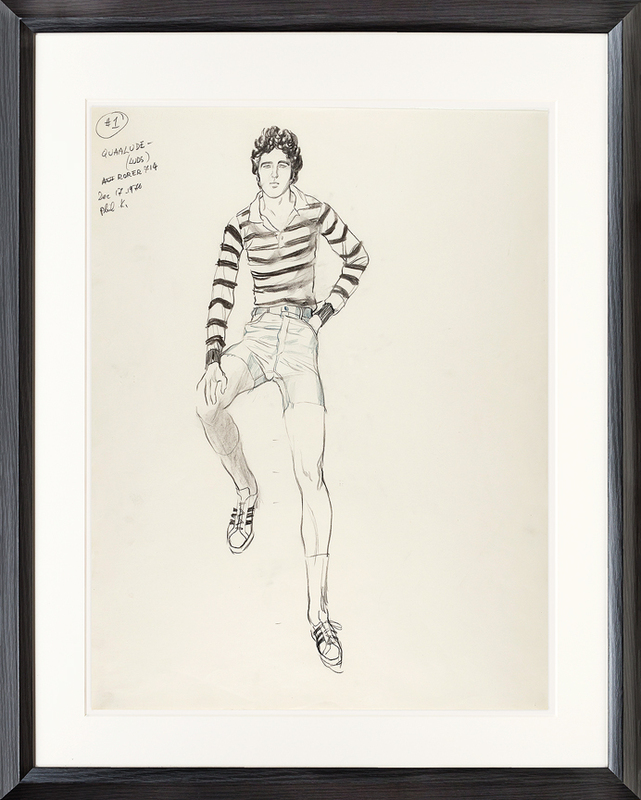 He returned to London in 1979. 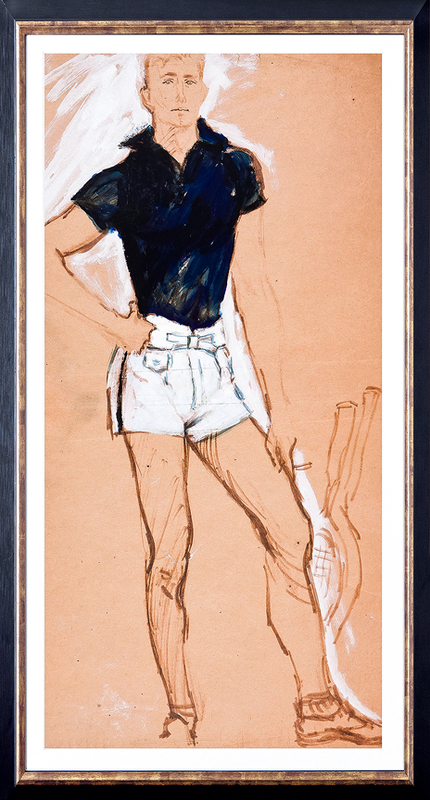 NOTE: Nothing will be sold before the exhibition opens at 6pm on Thursday 24th January 2019. 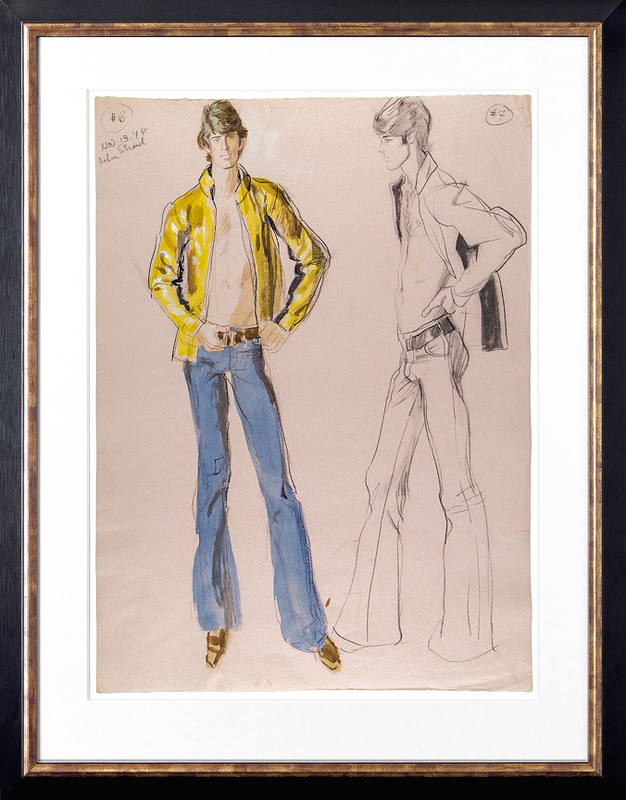 Please contact us if you are not familiar with our buying procedure for Exhibitions. 16. STONEHOUSE Brian M.B.E. 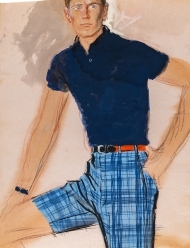 (1918-1998) The Tennis Shorts. 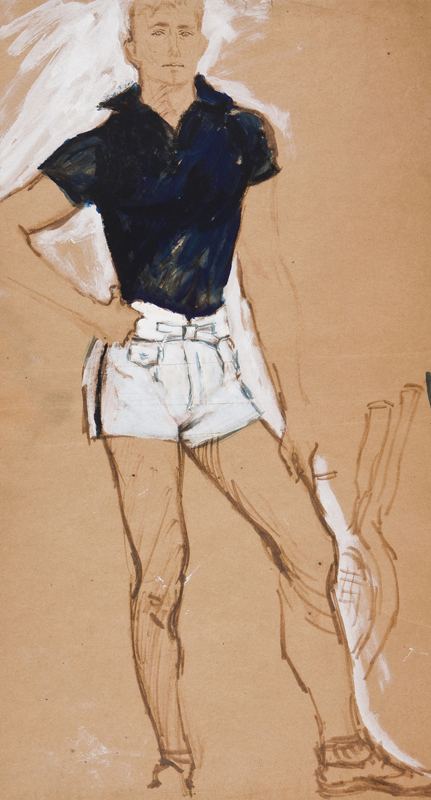 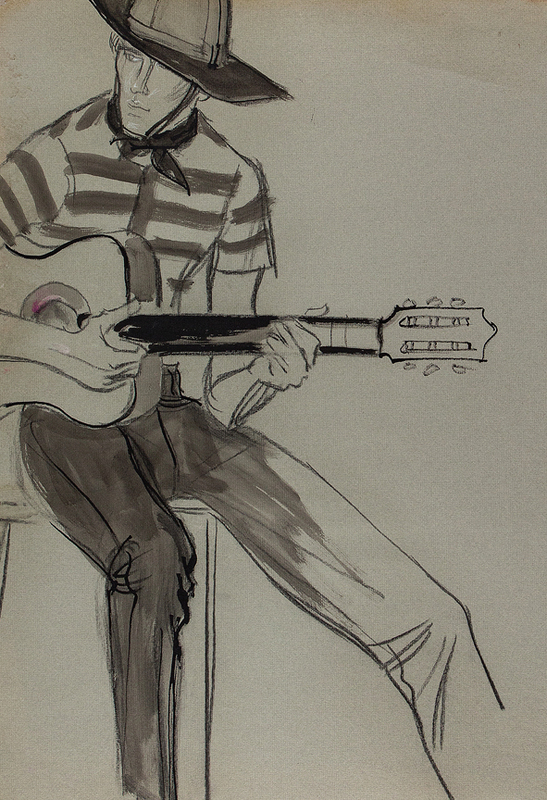 Gouache with fibre-tip pen on tan paper. 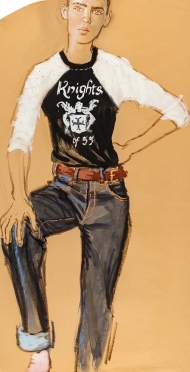 For an American fashion magazine, probably Vogue, circa 1960. 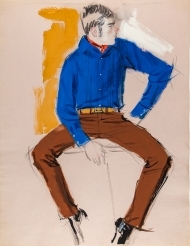 Provenance: The artist’s estate. Stamped ‘Stonehouse Estate / A and H’ verso. 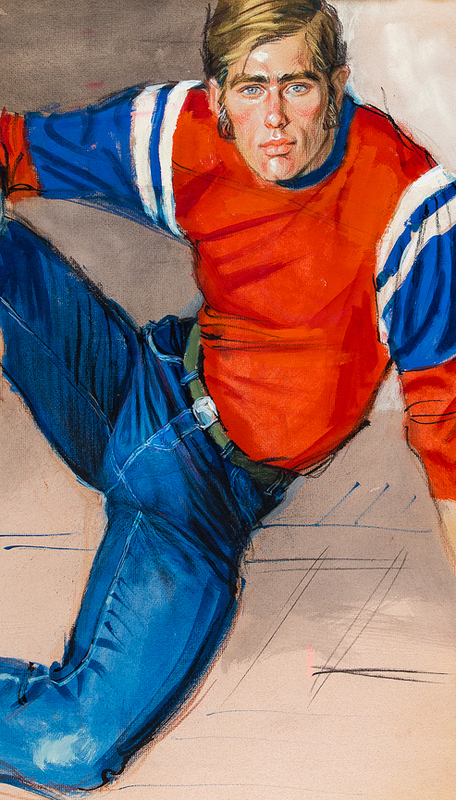 16.5 inches. 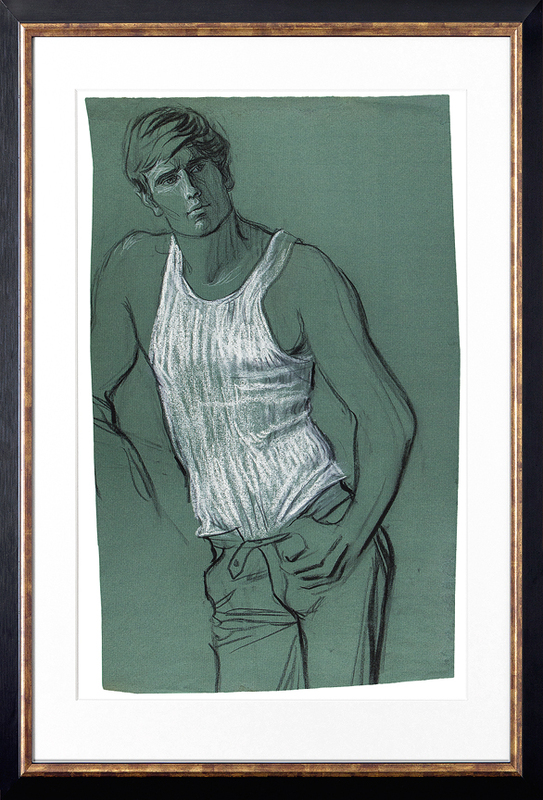 36.5x23.5 inches. £875. 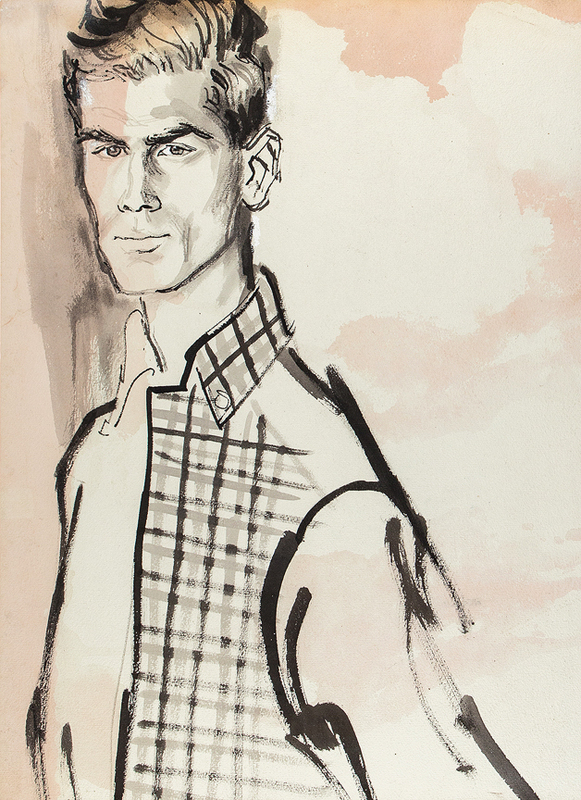 Of the many European émigrés to make a mark on the post-war New York fashion world Stonehouse’s WWII survival was considered by General Eisenhower as ‘one of the most amazing experiences of the war’. As a politically aware young art student in the late Thirties and fluent French speaker it was soon realized that he was wasted in the Royal Artillery and early in 1942 he was recommended for the Special Operations Executive (SOE). 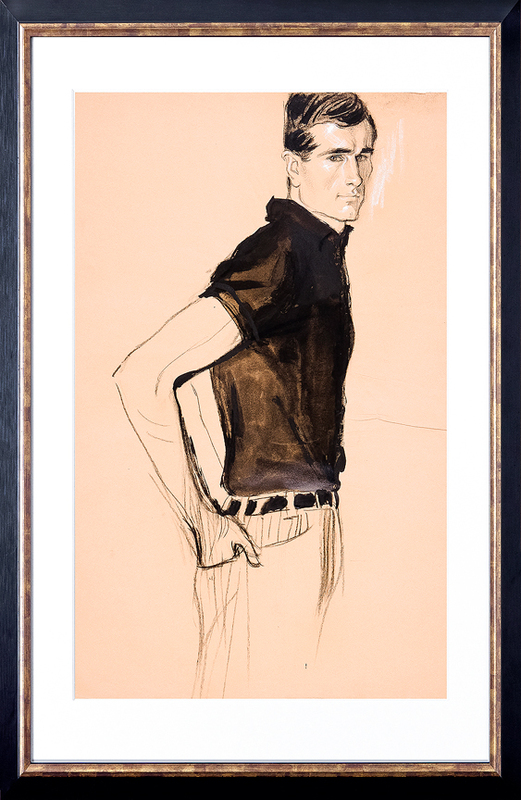 Founded in July 1940 the SOE was an elite group of men and women trained to infiltrate Nazi Europe and coordinate sabotage of the German War Effort from within. Disguised as a French art student, a B2 suitcase radio concealed within his artist’s box, he survived four hair-raising months transmitting from inside occupied France before being arrested by the Vichy French and the Gestapo. 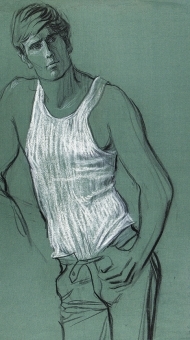 There followed two and a half years of torture, solitary confinement, a death sentence and slave labour in the Fresne prison and then the four Concentration Camps of Saarbrüchen (Neue Bremm), Mauthausen (Wiener Neudorf), Struthof-Natzweiler and, from September 1944 to April 1945, Dachau. 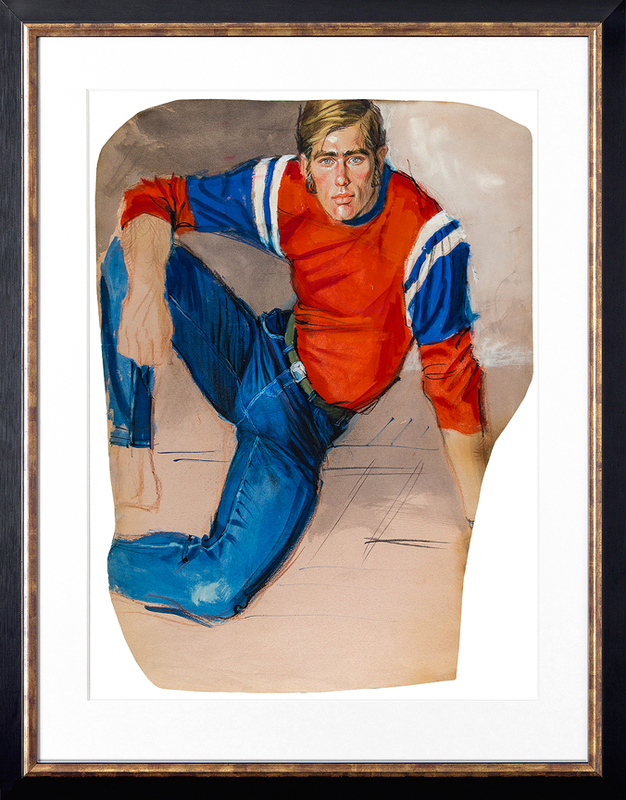 Contemporaries record him as an inspirational, Survivor figure who retained the respect and admiration of those with whom he was incarcerated. 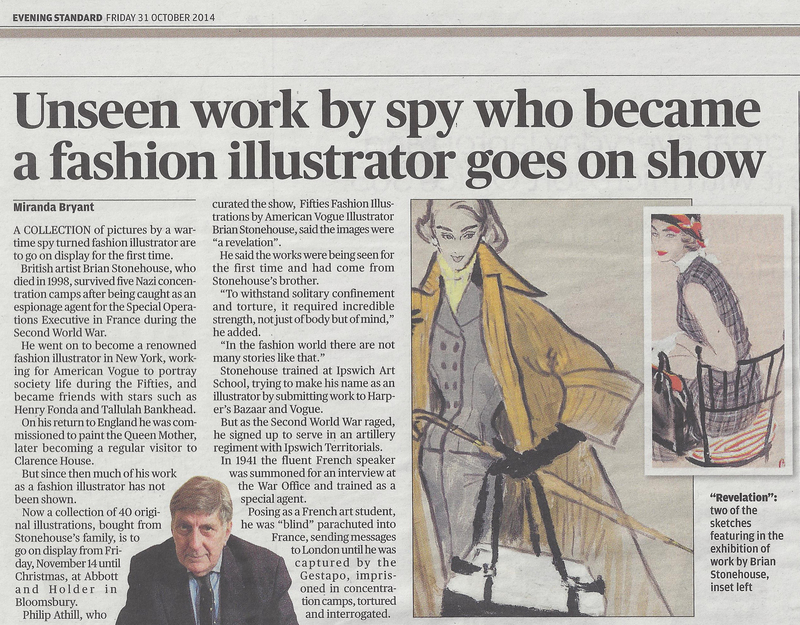 The Imperial War Museum and Dachau Museum hold the drawings he made of Dachau and at the War Crimes Tribunals. It was at the preparation for those Trials that he met Harry Haller, the socialite American Major who was to support his move the USA in 1946 and his new career as an artist and fashion illustrator. 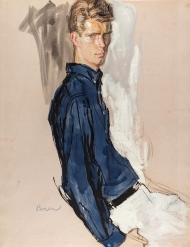 While at Ipswich School of Art in the mid Thirties Stonehouse had become interested in fashion illustration and portraiture however had little time to pursue a career before War broke out. 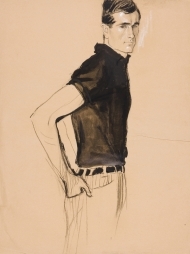 SOE made sensible use of his past when they created his disguise as ‘Michel Chapuis’, a french art student and the portraits of the German guards and their wives that he was ordered to draw while in Mauthausen had, bizarrely, helped to save his life (if not theirs!). 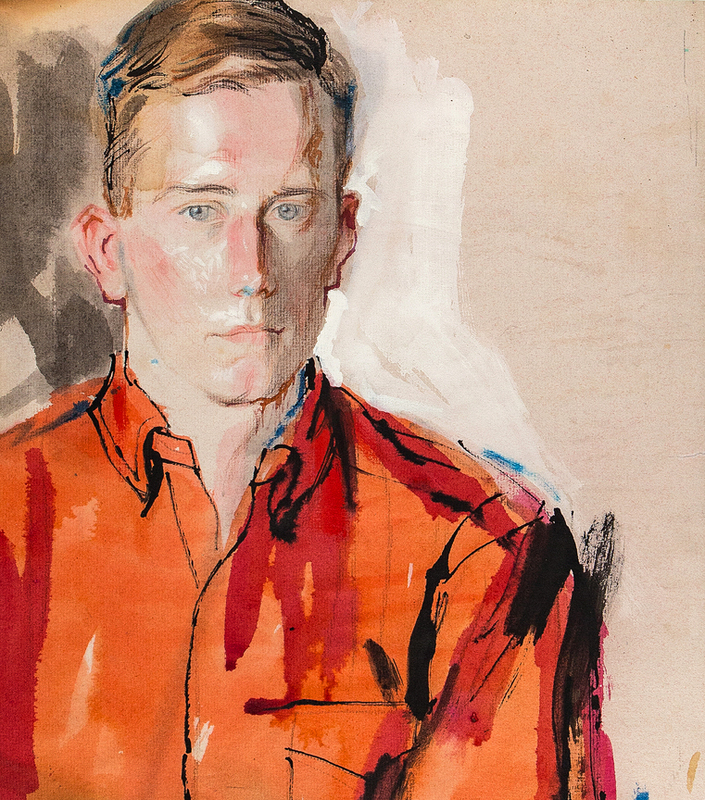 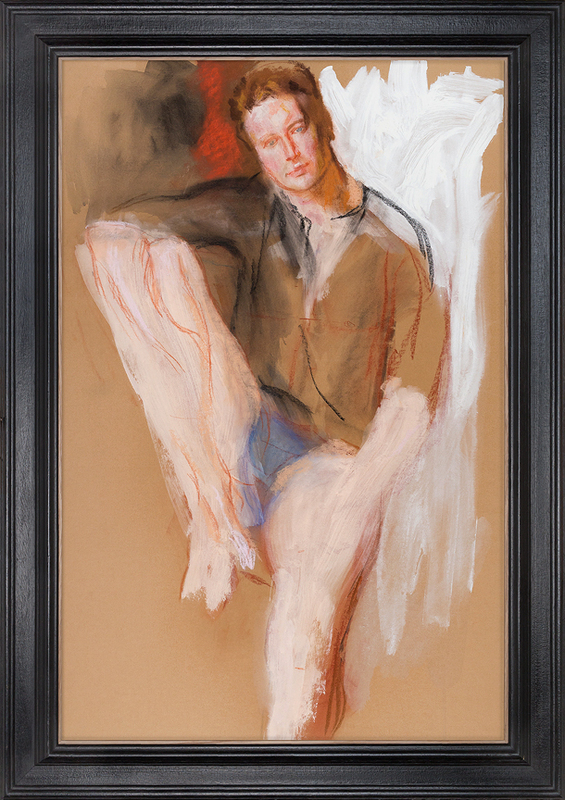 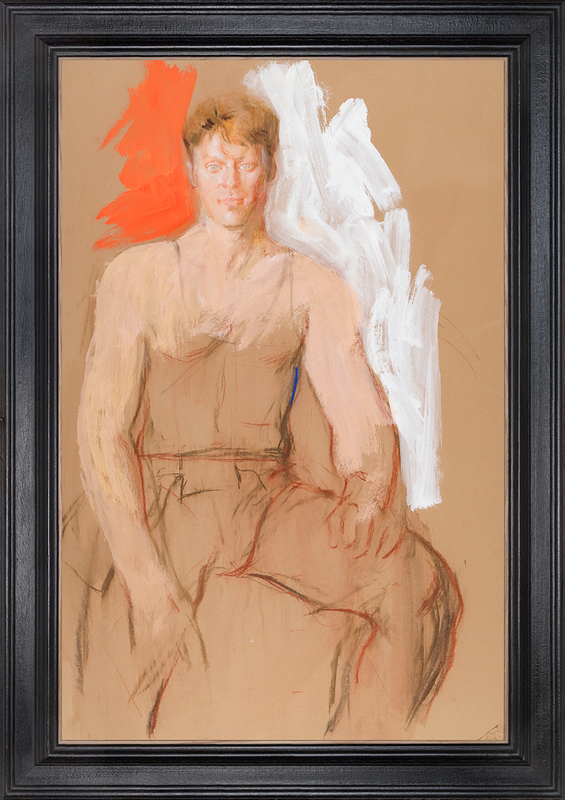 Harry Haller saw that these skills, combined with his Wartime celebrity, charm and Haller’s social connections might help establish him as a society portrait painter. 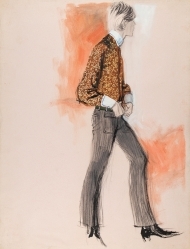 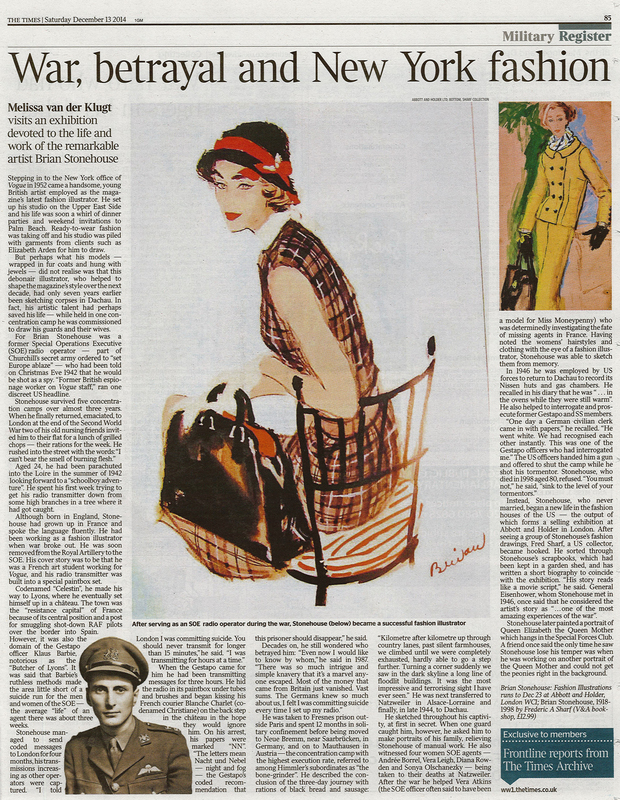 The timing of his arrival in the States was fortuitous; interest in fashion was strong after the drab war years and fashion illustration was still an essential part of magazine coverage. 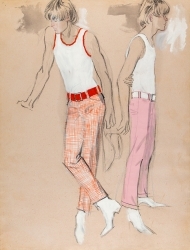 Vogue’s Editor Jessica Daves believed, correctly, that his stylish portraits of celebrities such as Tallulah Bankhead suggested an artist who might move into fashion illustration and in 1952, realizing what in 1937 would have seemed the most ridiculous of dreams, he became the first illustrator to be taken on by American Vogue since 1939. His time there coincided with that of Daves as Editor-in-Chief, until 1963, and he became expert, with ‘Eric’ (Carl Erickson 1891-1958) and Rene Bouché (1905-1963), the American Vogue illustrator stars, at conveying both the glamorous, couture look of the time and the emerging world of leisure wear. 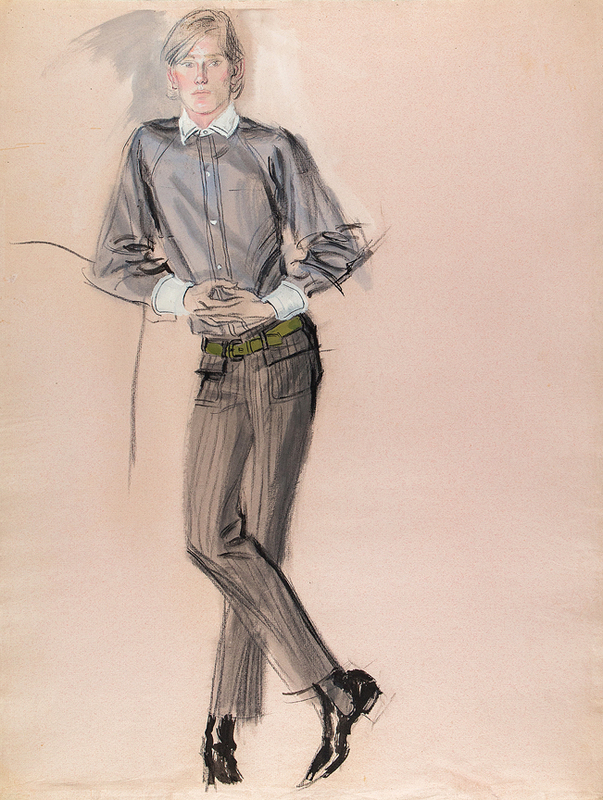 Stonehouse’s time at the magazine familiarised him with the world of advertising and marketing – essential to his illustrations had been a very practical understanding of Fashion as Product – and such was his reputation that he had constant advertising commissions, especially from department store such as Saks Fifth Avenue and Elizabeth Arden. 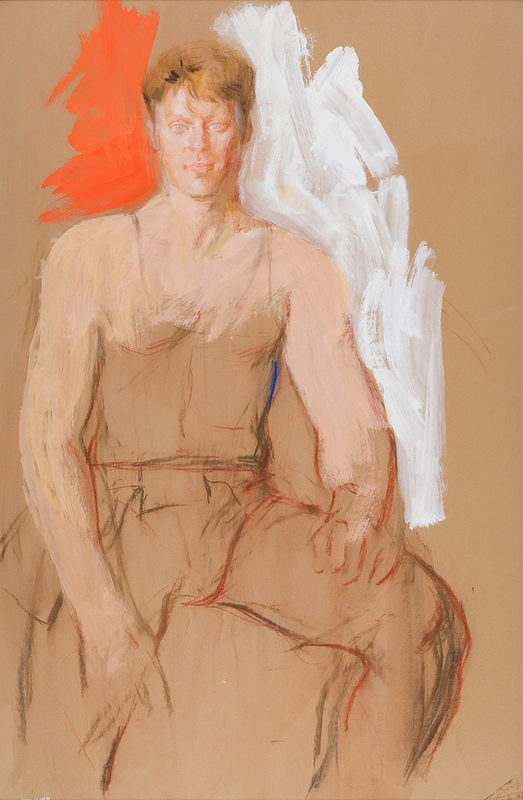 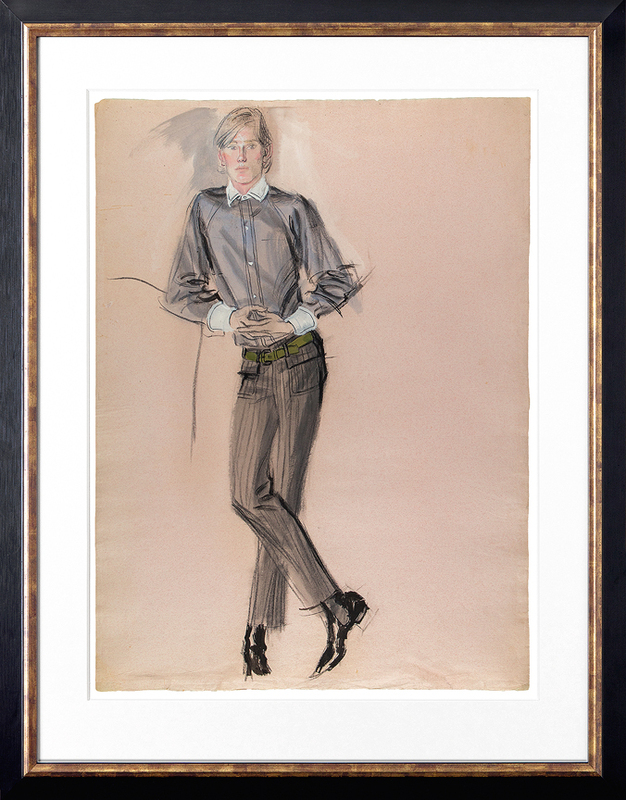 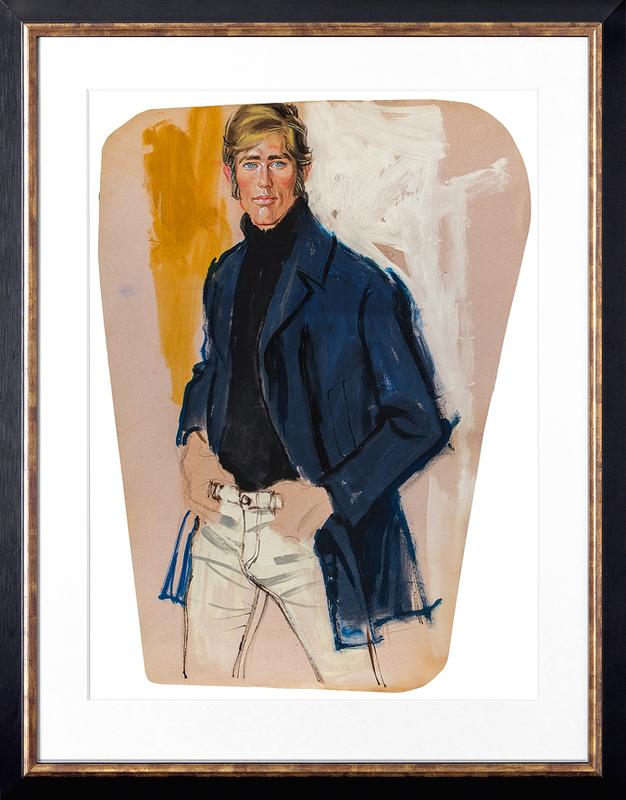 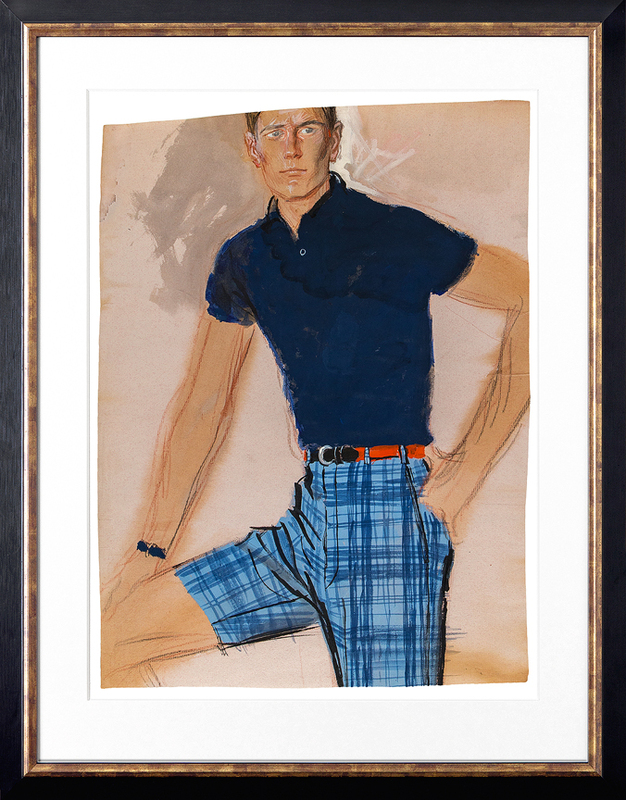 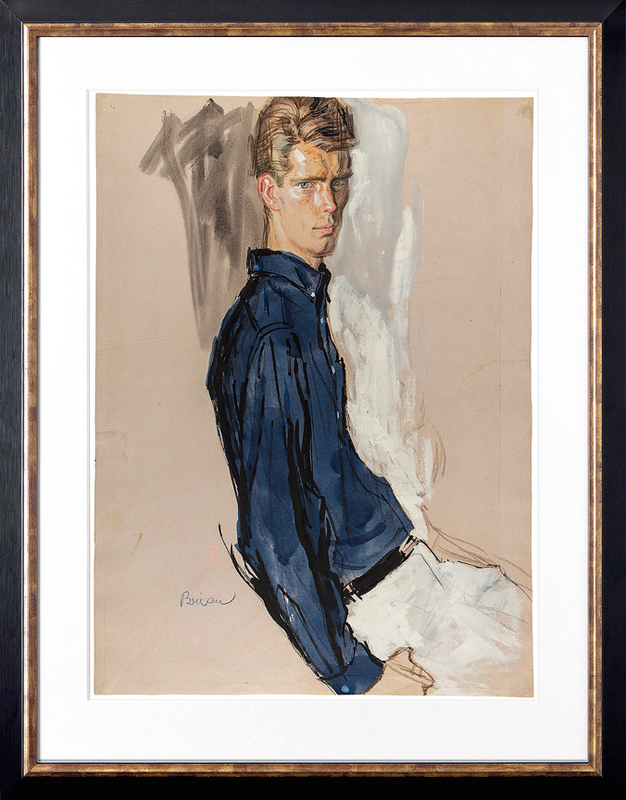 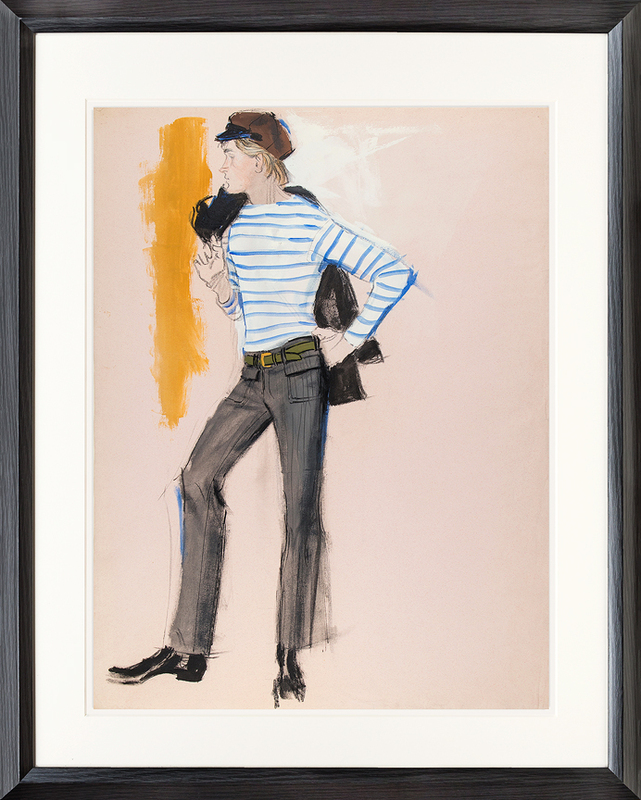 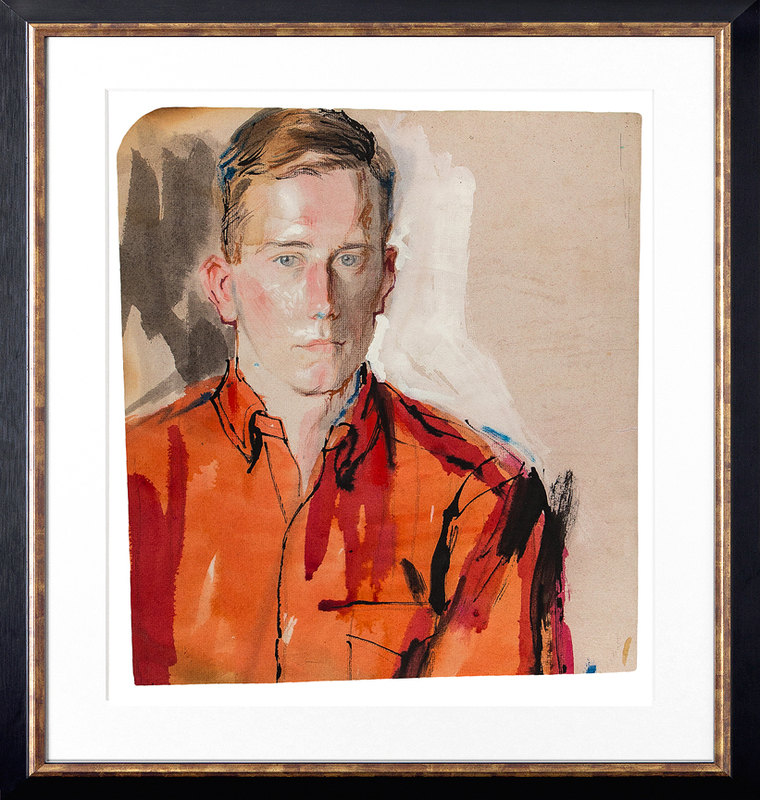 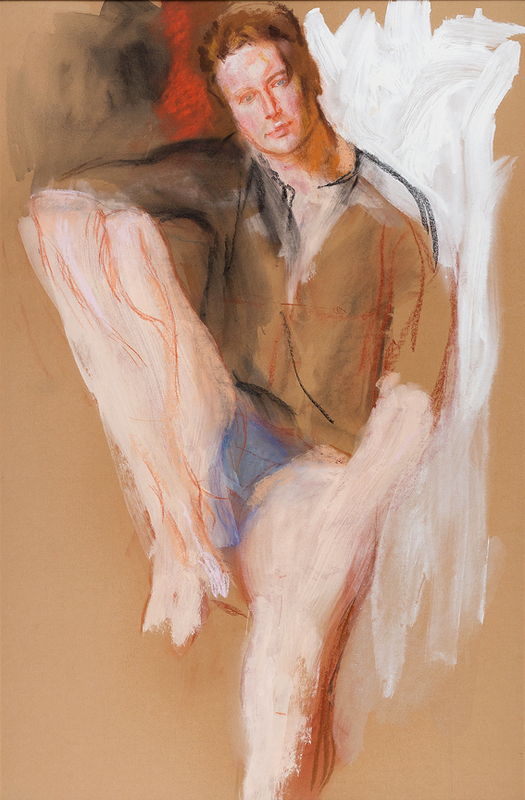 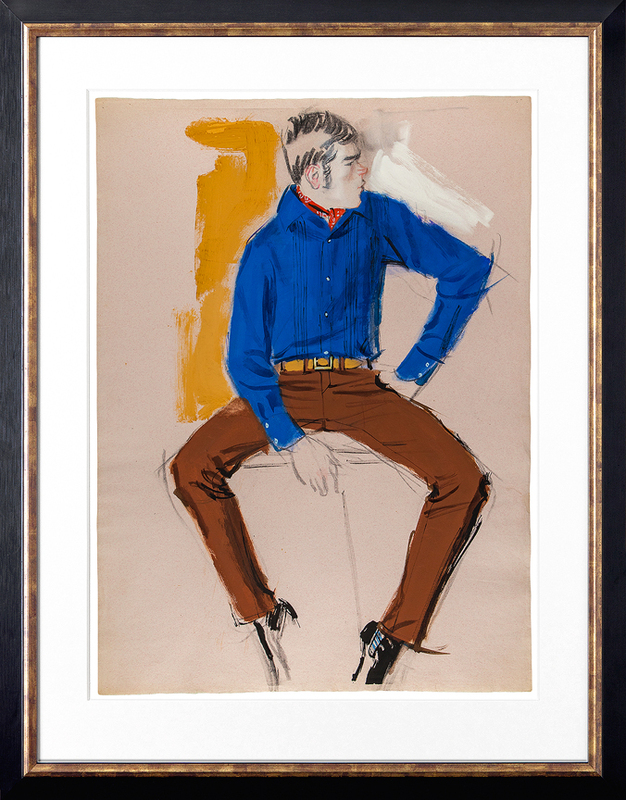 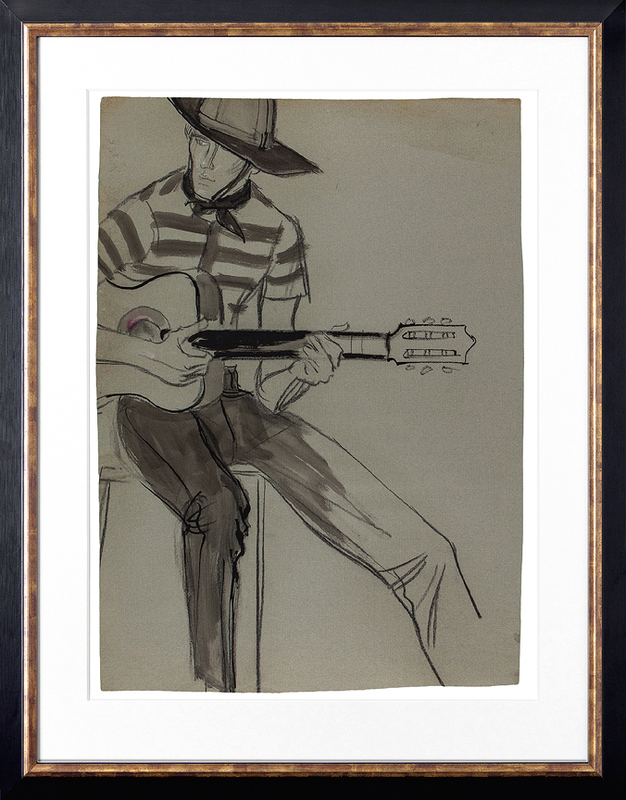 He could afford a Studio on the Upper East Side where he was not only able to establish a portrait practice but to store his fashion illustrations – material few advertising artists had the space to keep. written with Michelle Finamore, Curator of Fashion Arts, Boston Museum of Fine Arts, where the Jean S. and Frederic A. Sharf collection of Brian Stonehouse works is held. 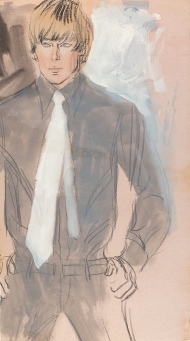 A digital copy of this book is made available below by kind permission of the author Mr Frederic A. Sharf. 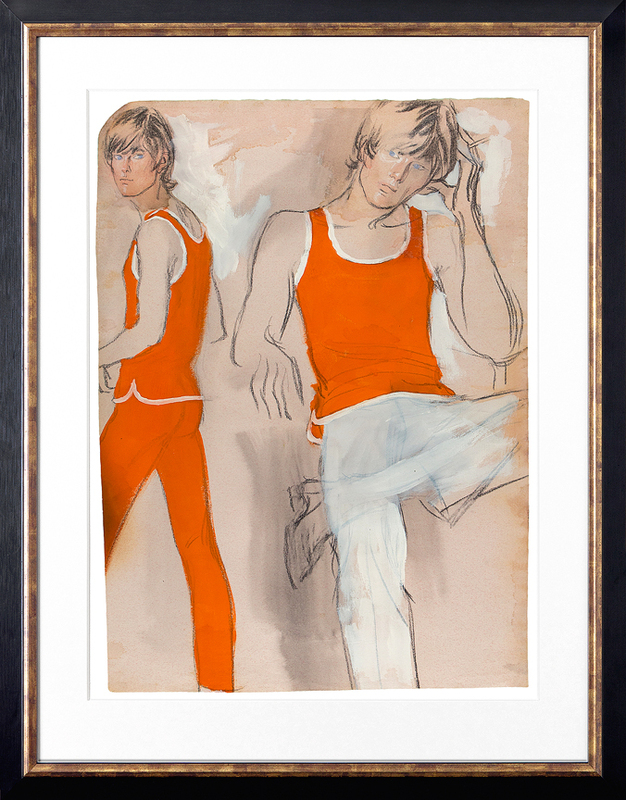 Each purchase from the Exhibition will be accompanied by a hard copy of the book.